During the championship game, I took a sequence of photos of Aboya jamming a monster dunk over Florida’s Noah. It was featured in a popular UCLA blog. Shortly after this, UCLA Athletics contacted me and wanted to buy the photo for their Men’s Basketball Media Guide. This is a thorough guide for press/analysts that covers everything about the team, program, and history (also a great guide for fans). 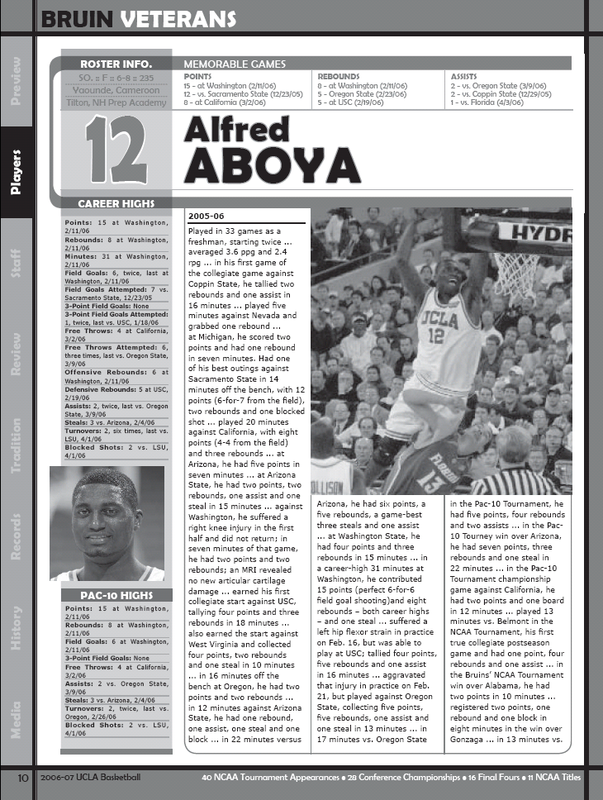 The media guide was published in November 2006. My photo appears on page 10, 174, and back cover. The back cover is in color and has a photo credit (“Photo (C) Donald C. Lee”). The color photo on the back cover is not viewable online. Only in the hardcopy edition. The media guide is online in PDF format on the UCLA Athletics website. This is my webpage on the 2006 Final Four trip.